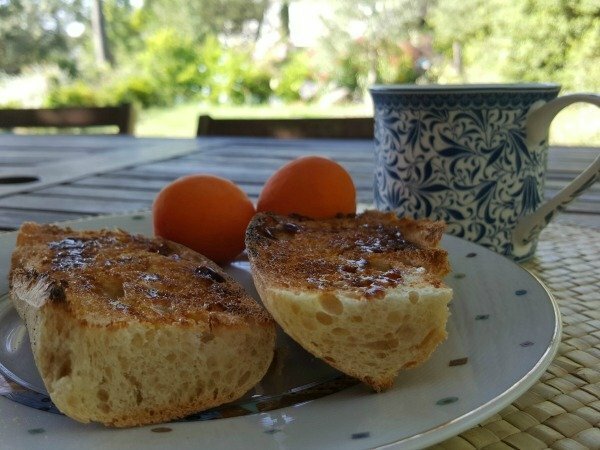 It’s not often I actually outrightly refer to our gîte in this blog, in fact I don’t think I’ve ever written explicitly about it, except for the time we were awarded a TripAdvisor Certificate of Excellence. Occasionally I refer to how easy a place of interest is to reach from Lou Messugo, or how close a certain walk is, but that’s it, nothing overt. However today I want to tell you about the many great reasons why you should not just read my blog but take that step further and actually book a holiday with us! So as not to overload you all at once, I’m splitting my reasons into 3 parts, to be published over the next 3 days. I hope you’ll take the time to read each section. Firstly, let’s talk about the word “gîte”, for those of you not too sure, it really just means a self-catering holiday (vacation) rental. 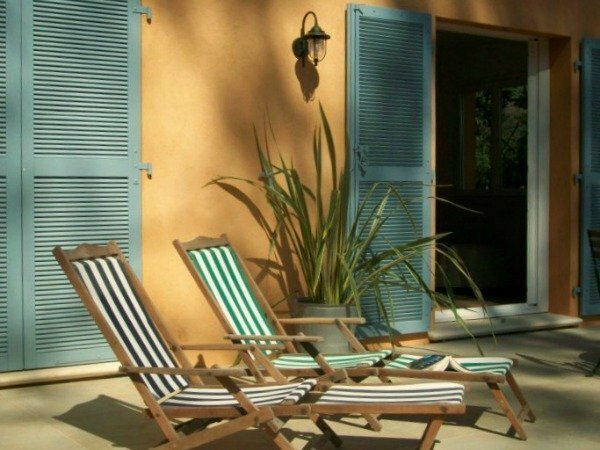 There are several different types of gîte in France, varying from basic stopover accommodation to luxury villas, and everything in between. The beauty of the word is that you don’t have to specify cottage/apartment/villa etc, it’s simply understood to be furnished holiday accommodation. I use the word for our place, Lou Messugo, as it’s short, snappy, French (thereby immediately indicating which country we’re in and possibly giving it a certain cachet) and I think it suits what we offer and sounds more charming than the word “apartment”. Which leads us to the fact that Lou Messugo is an apartment not a cottage and yet I don’t think the word reflects what we have here. For me, and I’m sure I’m not alone, the words holiday apartment conjure up blocks of flats, or at the very least, several flats in the same place. What we offer is a ground floor apartment attached to our family home. It is 100% independent, with its own front door and no internal access to our house. It is very sound-proof and despite being under our bedrooms you won’t hear us and we don’t hear you. The apartment has its own private sun-trap terrace which leads to a large garden. The garden is shared with us but realistically you’ll only see us in the area around the gîte if we’re actually gardening, so effectively you have a large lawn to yourselves. 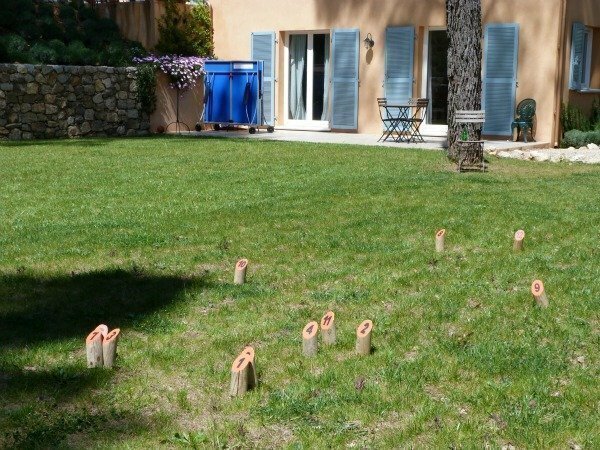 It’s big enough for football, badminton, croquet, mölkky (in the photo above), rounders, French cricket etc. In my mind this isn’t what you expect when you think of an apartment. The word gîte therefore fits Lou Messugo perfectly. Let’s talk about what else we offer, starting with the outside. We have a pool. It is fully fenced for your security meaning no toddler can wander off and fall in by accident. It is shared with us and after many years of running Lou Messugo we are very good at judging whether you would like to be left alone or wouldn’t mind our company. While you are here on holiday you are our priority and we work around you. Often we find our kids get on with yours and enjoy mucking around in the pool together giving parents a bit of time to read or relax without being on permanent play duty. Of course if you are holidaying here as a couple without kids we make sure ours don’t bother you! We provide sun loungers, inflatables and “noodles” as well as balls and other toys that can be used in the water. This means you don’t have to bring anything of this sort with you nor buy locally and either have to lug back home or leave behind. 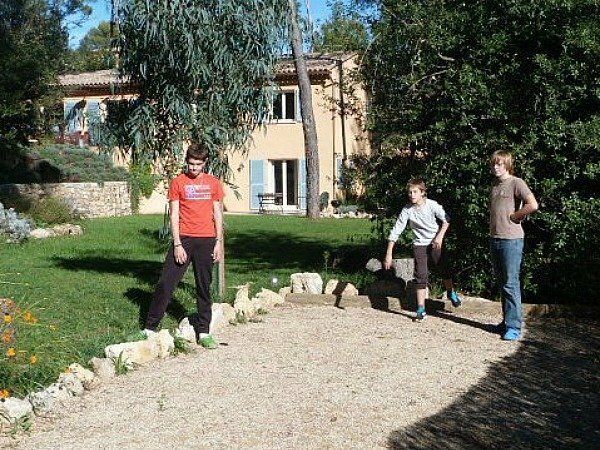 Other outdoor equipment includes a large netted trampoline, sandpit, ping-pong table and boules pitch (pétanque). We provide all the balls, bats etc necessary for these games (and badminton, croquet and other garden games). 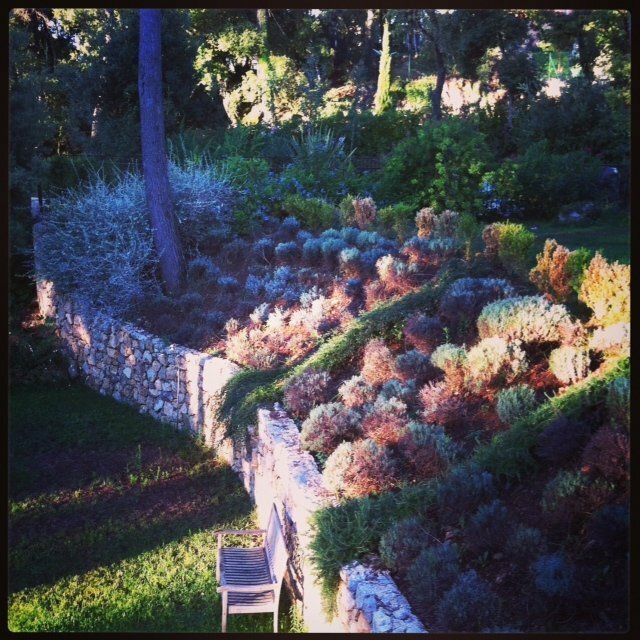 The climate is so mild on the Côte d’Azur that children in particular use the garden all year round (the photo below of boules is in late October). The pool however, is usually in use from about April till early October (depending on the weather). Finally, in terms of outdoor equipment, we also have a number of bikes, go-karts, scooters and trikes that you can borrow and our lane is so free from traffic that children can safely ride around outside the gate. 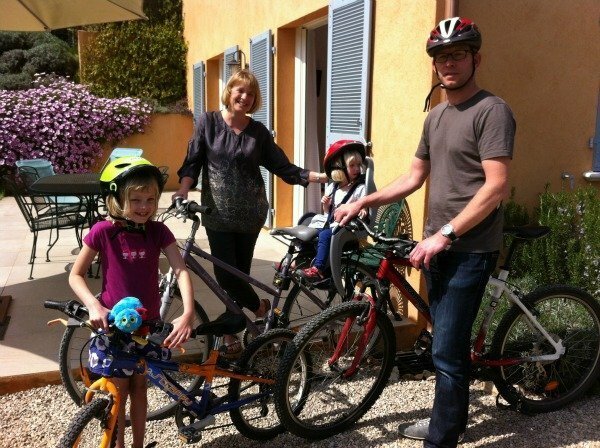 Depending on the make up of your family we might have the right size bikes for you all to go for a ride together, we even have a baby seat, suitable from about 6 months to 3 years. There’ll be more great reasons, highlighting the interior of the gîte and our personal touch coming up in subsequent posts but if I’ve already convinced you to get in touch to discuss your self-catering holiday needs please use the contact form on the website, found at the top of the page, or leave a message here. Questions and comments always welcome. Exactly, freedom is the word! Thanks Charly, I’m glad to hear from a gîte fan, I hope you get here one day. The rate is for the gite, for up to 4 people. It is very reasonable! Looks lovely, a holiday home with everything a family could need. I had a look at your rates, these are very reasonable. The weekly rate is for the accommodation or per person. We haven’t had a real, family holiday. However we want to go aboard this year. Of course I remember you and your 2 lovely girls, how lovely to hear from you. 🙂 I’m so happy to hear you have such good memories and I really hope you do get back here again one day. We take holiday here in 2013 and still dream it every day, it was nicest holiday in many years. Do you remember us? Family from Azerbaijan. I hope we can come back again soon. I LOVE astonishing annexe, I may well be rebranding! Thank you Lucy! What a beautiful place! You are so right, ‘apartment’ could never do it justice. Hmm… how about ‘palacial penthouse’ or, um ‘astonishing annex’! I’d love to meet you Jen, I hope you do come here one day, just don’t leave it too late, we’re nearly full for this summer! Thanks Mags, I really hope you get back to us again in 2016, we’d love to see you! Thanks for commenting Clare, we always enjoy hosting you at Lou Messugo. 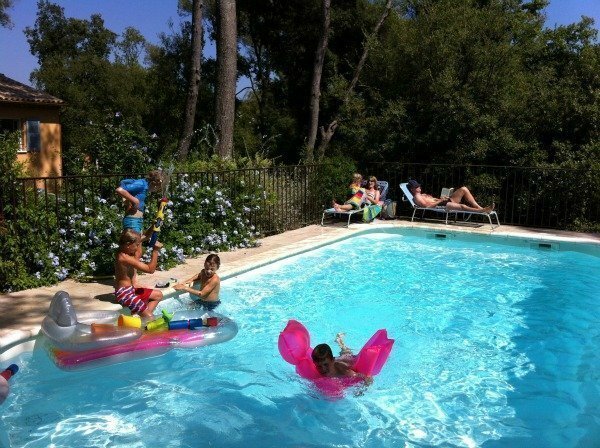 Wouldn’t it be lovely to create some memories of childhood holidays in France for your children here too? I hope you think seriously about booking as you say we’re “perfect” for your family. Thank you Samantha, it is! It just looks idyllic – very stress free and laid back! Oh lovely. We are contemplating somewhere for Summer. 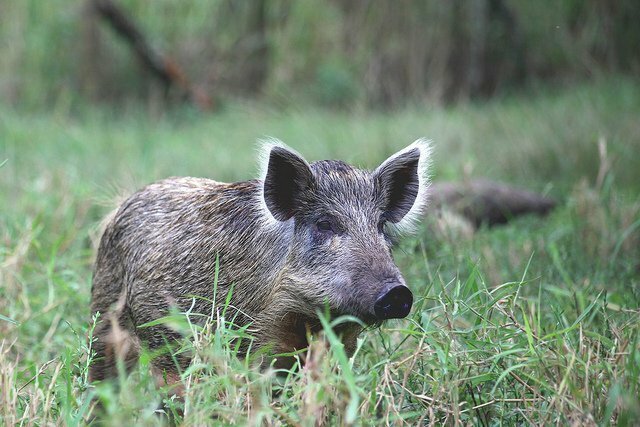 One day we hope to visit you! 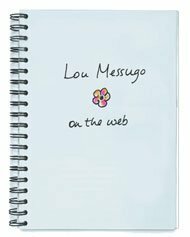 We have stayed a few times at Lou Messugo and I would agree with all of the points in this blog. 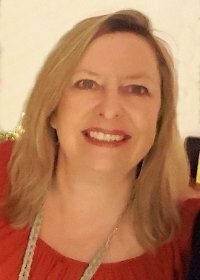 Phoebe always makes us very welcome and there is everything we need for the children which means it is truly relaxing. I’d love you to come Emma, please stick to your promise! We are busy planning our adventures and I am so looking forward to that warming fire. Isaac wants to collect eggs from the chickens too!